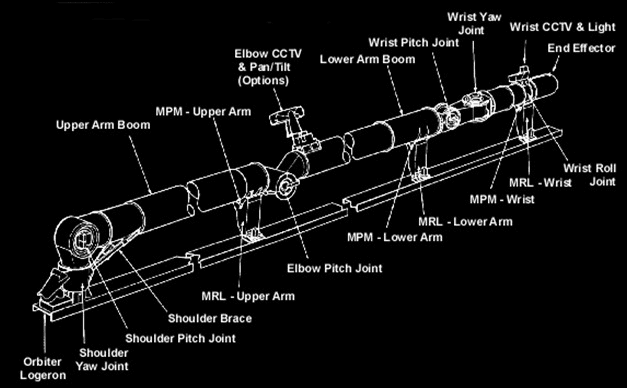 Also learned via SpaceflightNow that a software patch applied fixed the troubles with the Canadarm on the International Space Station. I was asked by the director if I would continue to support the information technology at the Carr Astronomical Observatory. 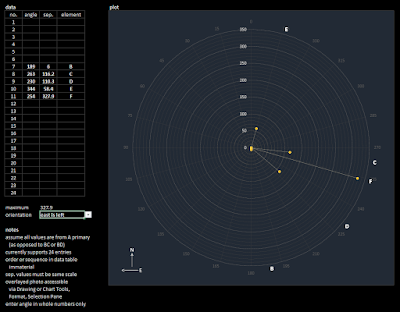 I wanted to triple-check colours and positions of the companions of Σ1327 so I asked the Burke-Gaffney Observatory to image the multi-star system in the constellation of Cancer. Luminance only, 4 seconds subexposures, 10 stacked shots. FITS Liberator, GIMP. North is up; east is left. I observed this system 16 Feb '14. And we sorted out the odd details on 16 Apr '14. A and B are very close together. 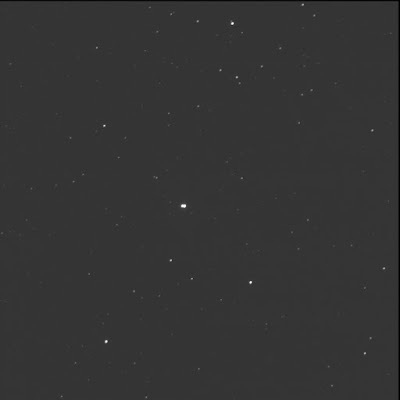 SkyTools says they are 5.5 arc-seconds apart, which is nearly the resolution limit of this imaging system. Still, there's a gap, a black line between. B is north-east of A. C is much further away, to the north. In luminance, B and C seem equally bright. C and D, at 2.2" and a high Δm, are not resolved. I look forward to inspecting the results with the LRGB colour data. Strange. I did not identify the elements of SAO 87428 when shot for BGO. 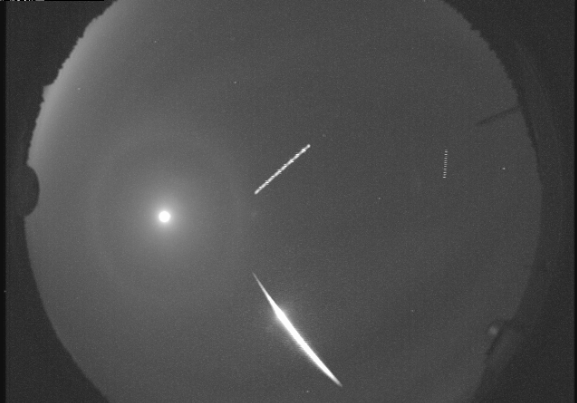 And it was not listed in my SkyTools list for BGO completed images... Corrected for this. Did I forget back on 12 Sep '16? Very odd as it was logged in ST3P! Logged but no list entry. Anyhoo. Then I noticed Minkowski's Footprint wasn't in the BGO completed list either. But that's another story. As I completed the colour processing, I thought I could then update the doubles life list. There was no colour data recorded. But then I spotted other blog references! I had viewed the system on 2 Jul '16. 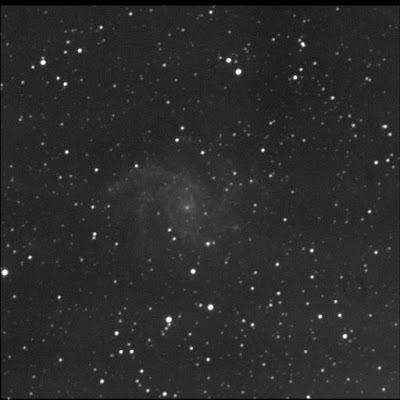 And then imaged it with the DSLR on the C14 on 29 Aug '16. And both times not bothered to describe the colours! Weirder and weirder. So had a go with the DSLR image and tagged stars with colours. 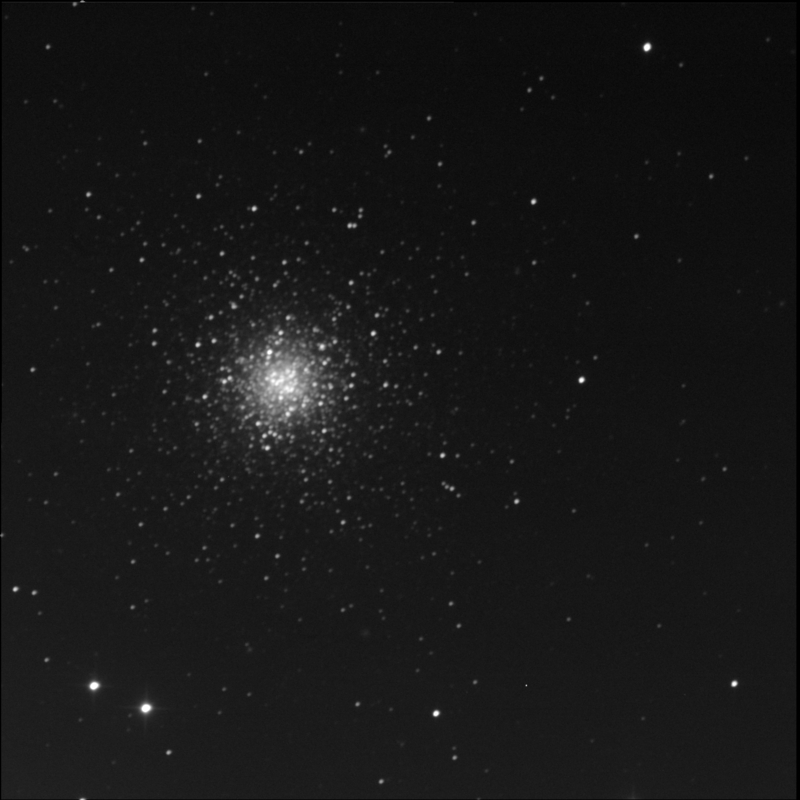 Then studied the most recent image, with the fainter stars. All the while I was doing this, I wondered what was up with the E star. Was it the bright star opposite G from C? 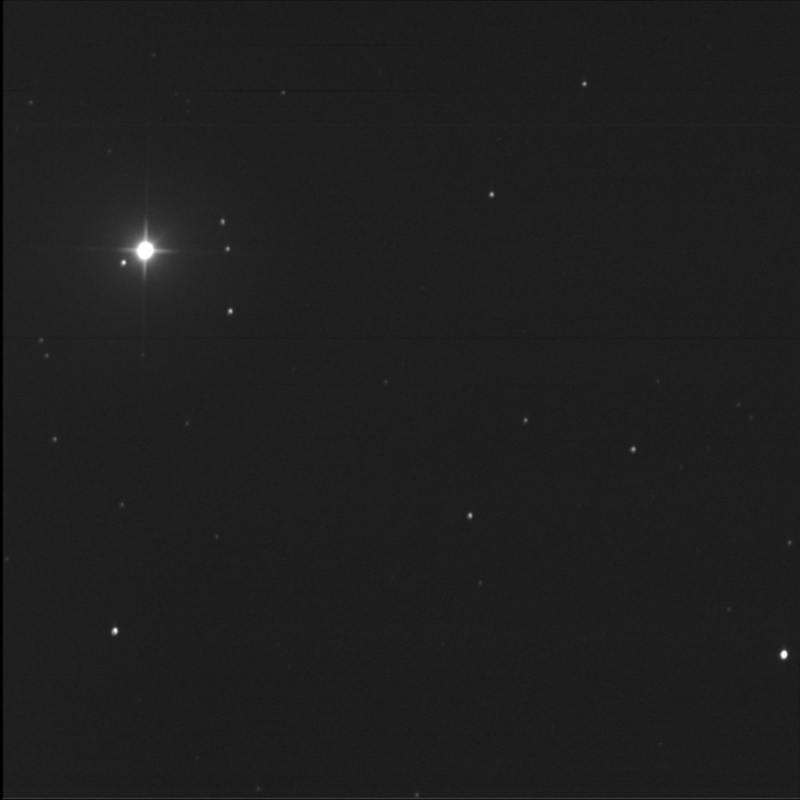 So I jumped into the Washington Double Star database and looked up SLE 647. Whoa! There were 9 entries up to J (no I)! Correction: there are I and N companions! So 12 stars. 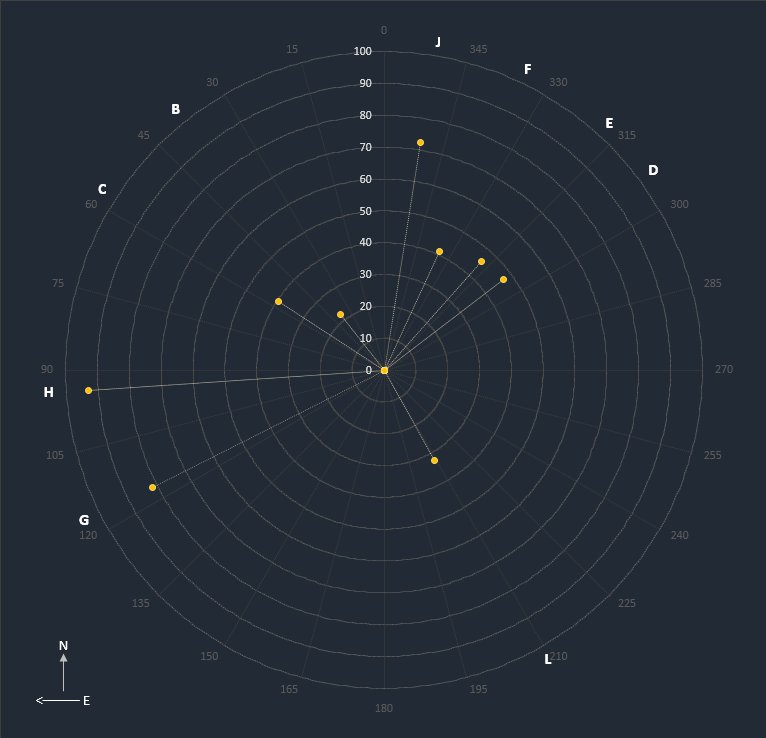 SkyTools shows A, B, C, D, G, and H and the positions correspond. WDS adds E, F, J, and L, all of which I see in the BGO photograph. E, aka FYM 43 AE, is dim and orange and north-east of D. Is it almost exactly between D and F.
F, aka FYM 43 AF, is the blueish star east-north-east of E. It is slightly brighter than D.
J, aka FYM 43 AJ, is the mystery star opposite G. It is dimmer than D but brighter than F. Pale blue. L, aka FYM 43 AL, is an extremely dim orange star south-south-west of A. It is barely visible in the BGO image! WDS says it is mag 15.1. I noticed in the WDS that stars D, G, and H are associated with BKO. Hello Mr Berko. BKO 72. And then I noticed other BKO 72 and FYM 43 entries. Oh ho! I plotted BKO D, E, and F separately and they corresponded to the main plot. 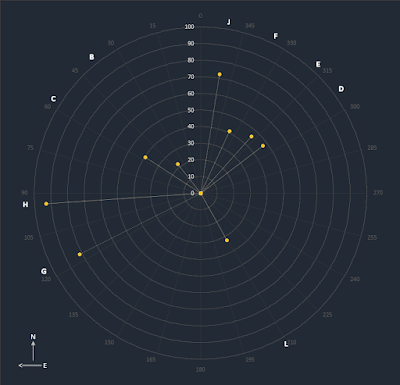 I plotted BKO 72 HI. Ha! This is the faint star near H, to the north, clearly visible in my BGO shot! It is a touch dimmer than H. Could it be redder? Finally I plotted FYM 43 JN. The WDS says it is north (325°) and tight (2.4") and very dim (mag 16). I don't think this is visible in my image. So. Wow! This started out as a double star system not properly updated in SkyTools and with no colour data on the life list and I ended up logging a bunch of new stars! 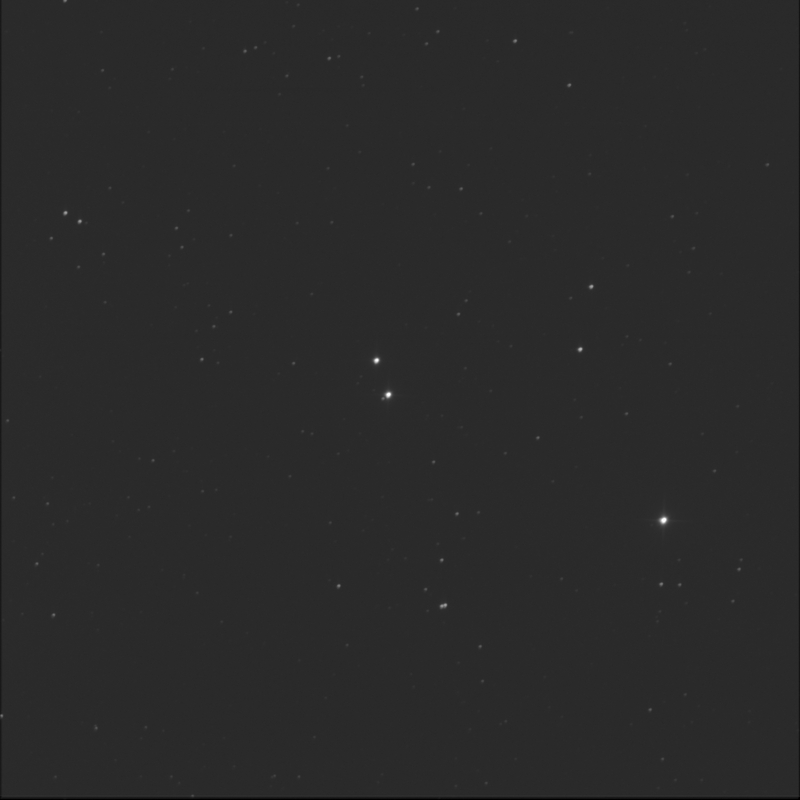 Assembled multi-star system SAO 87428, aka SLE 647, in colour using the LRGB data gather on 12 Sep '16. Luminance 7x10, RGB 7x5 each. FITS Liberator, Photoshop CS2. This image worked out really well. All the colour channels looked flat and smooth, without gradient. There did not seem to be major artefacts or problems. I used Arcsin(h) function on all, adjusted the black to the dip to zero, and adjusted the white to the end of the densest data. The green was slightly off but I boosted it in Ps. 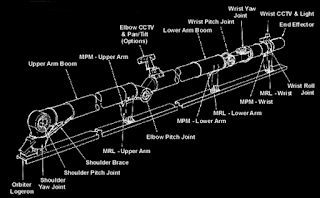 Learned of the off-course anomaly of the Ariane rocket from the SpaceFlightNow article. Happily, the two payloads are functional and should recover from the incident. But this has got a few people nervous now. Hopefully, the Arianespace will have a perfect launch for the James Webb Space Telescope. 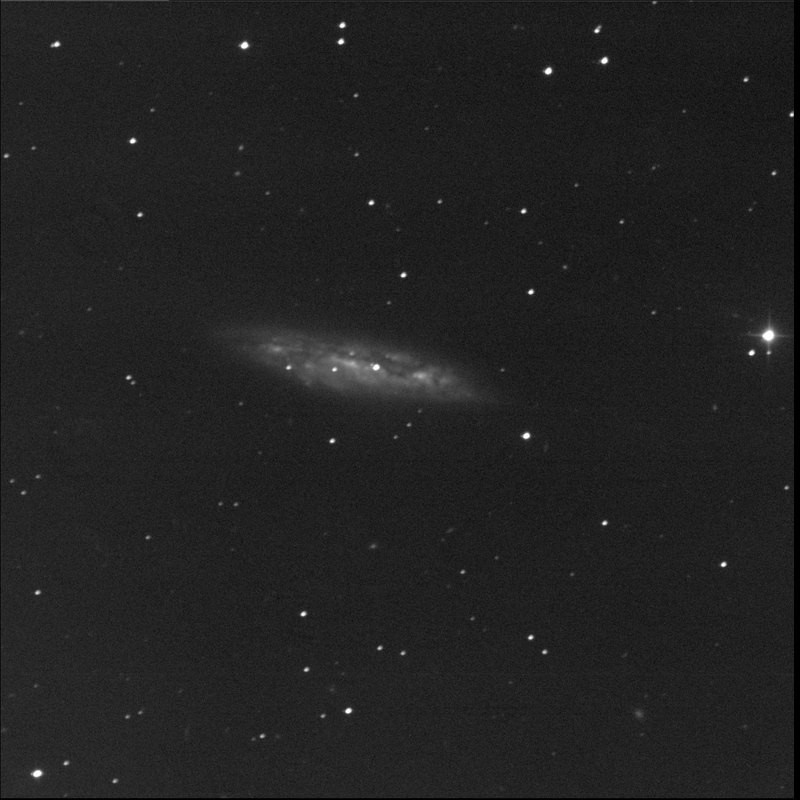 Asked BGO to gather more data for NGC 4656 aka The Hockey Stick. In particular, I was hoping for less gradient than before. Alas, the images were not any better. With my custom Excel chart, pulling data from the US Naval Office, I made an astronomical almanac chart for 2018. Been a while since I published this. Venus will spend much of the year in the evening sky hovering near maximum elongation for July, August, and September. Mars will transition through midnight, and opposition, in the late summer, mid- to late-July. Jupiter on the other hand will be near opposition in early-May. 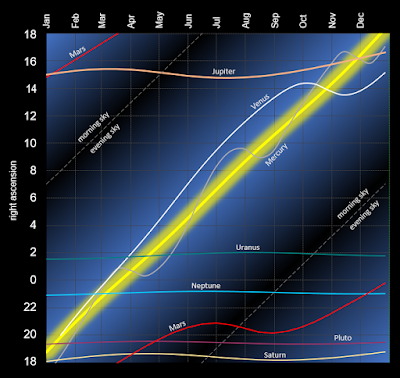 Saturn will be highest in the evening sky in June and July. Uranus and Neptune will be near opposition in September and August respectively. Late February, Mercury, Venus, and Neptune will be close together at sunset. In late March, Mercury, Venus, and Uranus will be in the evening sky. Mercury will join Venus in June. In October, Mercury, Venus, and Jupiter will be together. Mars and Saturn will be together at the March-April transition. 1:15 PM. An message was issued from the Clear Sky Alarm Clock for the BGO in Halifax. The Clear Sky Chart showed lots of blue. Again! Huh! 5:00 PM. BGO tweeted it was "waiting for the sky to clear..." A few moments later, it reported the sky as "clear and dark." All right. The 'bot was starting up the observatory! w00t. 5:35 PM. BGO said it was beginning the programmed observations. Fifteen minutes later, the robotic telescope shot M33 for Lane. I was happy to see we were up and running. I was excited. And stinging perhaps from last night where the sky conditions looked rather good but the dome remained shut, frozen due to ice. The Clear Sky Chart showed a long run of dark blue in the afternoon. I received an email from the Clear Sky Alarm Clock system. The Twitter feed showed activity around dinner time. Sonoran Skies pulled a weather map. It showed clear at the moment. The 'bot reported it was "waiting for the sky to clear..." In anticipation, I updated my staging list in SkyTools 3 Pro on John Repeat Dance. But at 7:09 PM EST, still nothing. Later, I double-checked the weather reports. Environment Canada said some clouds while Clear Outside showed good at midnight through to morning. But no email alerts arrived. oh rats...the #human checked the logs and last night the dome froze in place again so my run failed to start. #human, do a better job this time pls!!! Greg and I tested another release of SkyTools 3. It is still generating SSL errors and Greg is convinced it is due to core operating system issues. Some revisions to SSL security are simply not supported by the old Windows XP platform. Greg doesn't want to put any more effort into and I can appreciate why. Along the way we rejuvenated the "current updates" features and that's good enough for me. 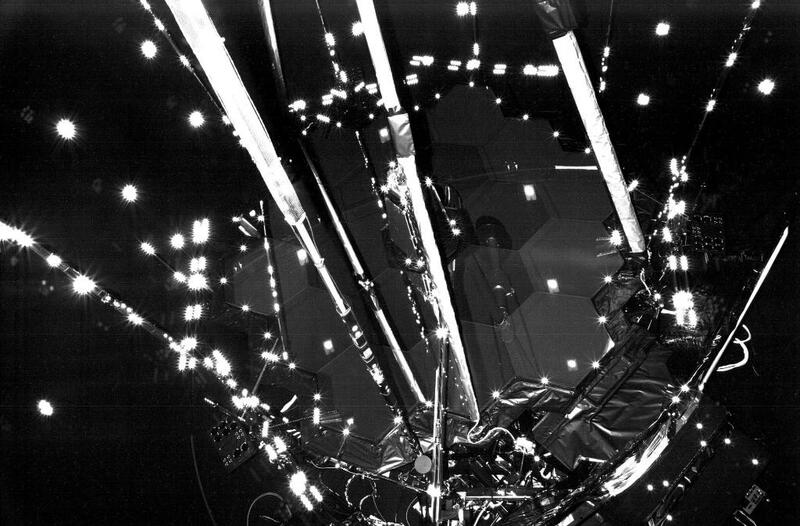 Read the article at SpaceflightNow on the James Webb Space Telescope. 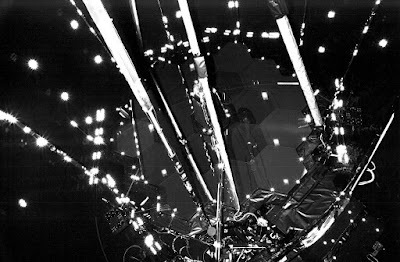 It completed important testing in the vacuum chamber at the Johnson Space Center, a significant milestone. 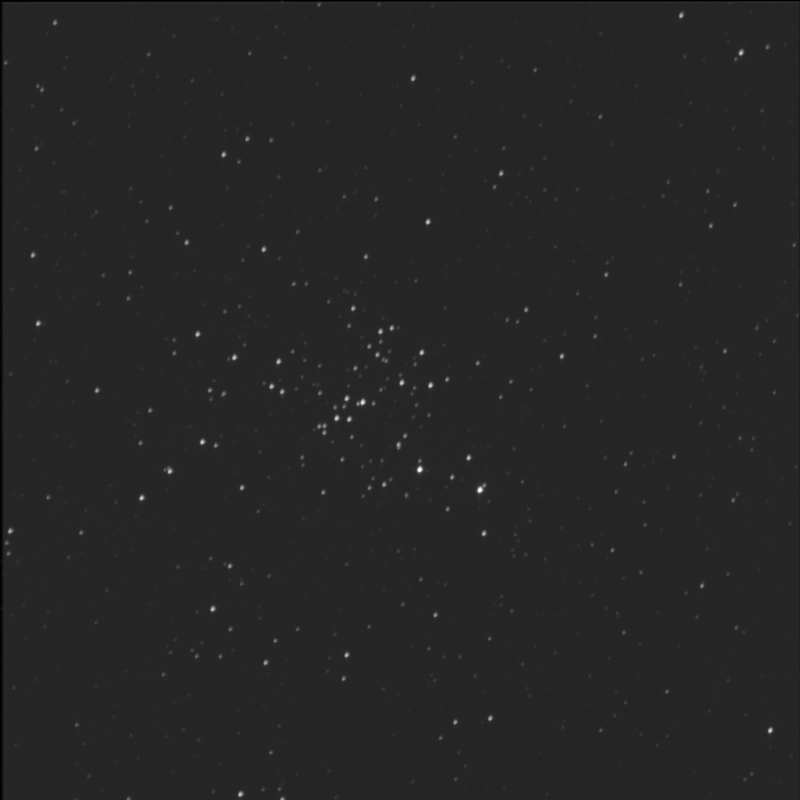 Alignment and optical quality was verified with simulated stars. Next step is to add the sunshade and flight control systems. 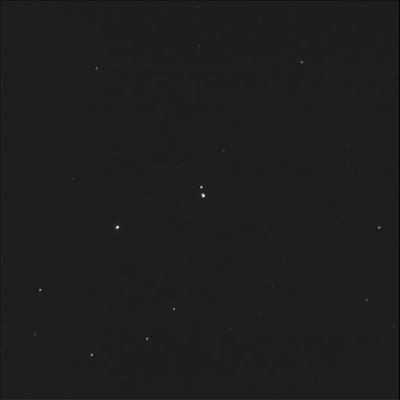 Reviewed double star ARA 753 imaged in August 2017. Tried to sort this 10 Dec '17. I compared data from SkyTools 3 Professional and the Washington Double Star database. The bright pair to the north-west of the S star of U Sgr which ST3P refers to as GSC 06274-1098. So, I think I have figured this out. It looks like ARA 753 is the bright double north-west of S and it looks like ST3P is wrong. And therefore I think I have in fact split this particular double. SkyTools calls ARA 753 the pair to the west of S. But the position angle and magnitudes don't match. 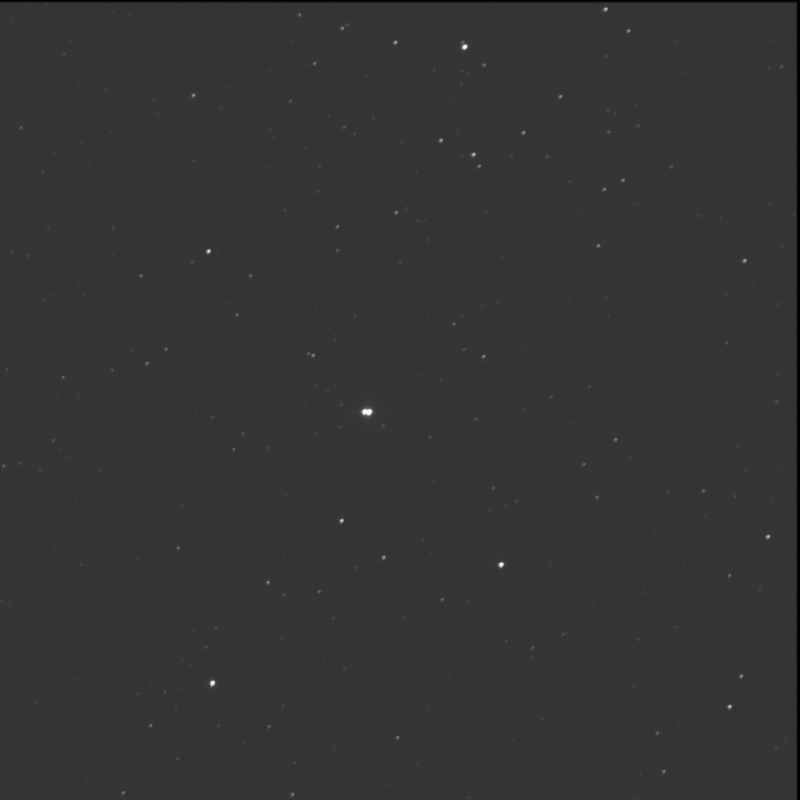 I verified the Apogee camera chip is 4k by 4k. The system is using bin x 2. So then effectively we have a 2k by 2k (2048) image. Verified the reduced default image size is now 1336x1336 (from 1536x1536). 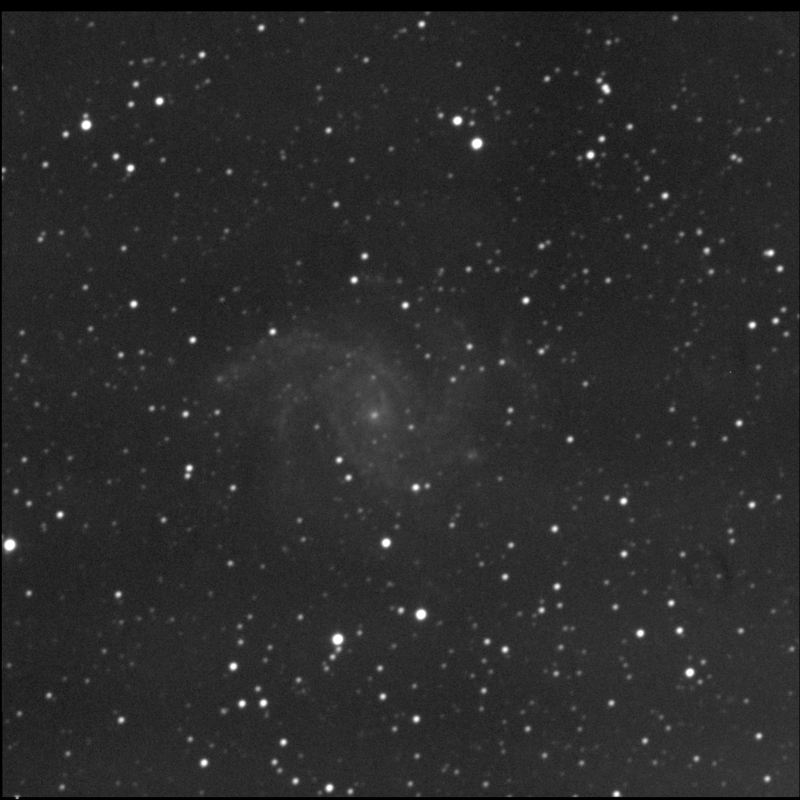 This was done with the integration of the second camera (a SBIG STXL 11002) that when binned will be 2004x1336 pixels. The BGO director wanted the default image, which fits most objects, to be the same for both cameras. This change occurred back on 12 Aug '17. BGO sent a message that the images were ready for processing. At night! Is this a new feature? Normally they are not offered up until the next morning. I suspect it is more likely because the imaging run stopped short. Drafted the next article for the RASC Journal column. 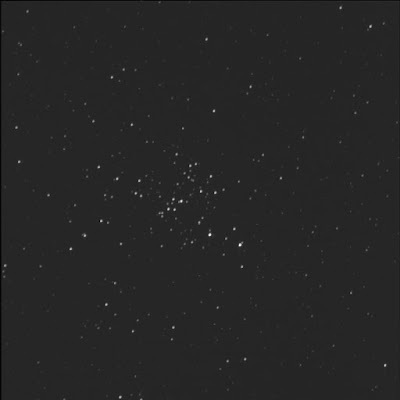 Commanded the BGO robot to photography NGC 3521 again. One of the first Finest NGCs I tried to image (back in March 2016). Tried again on 26 Feb. Possibly the best result. 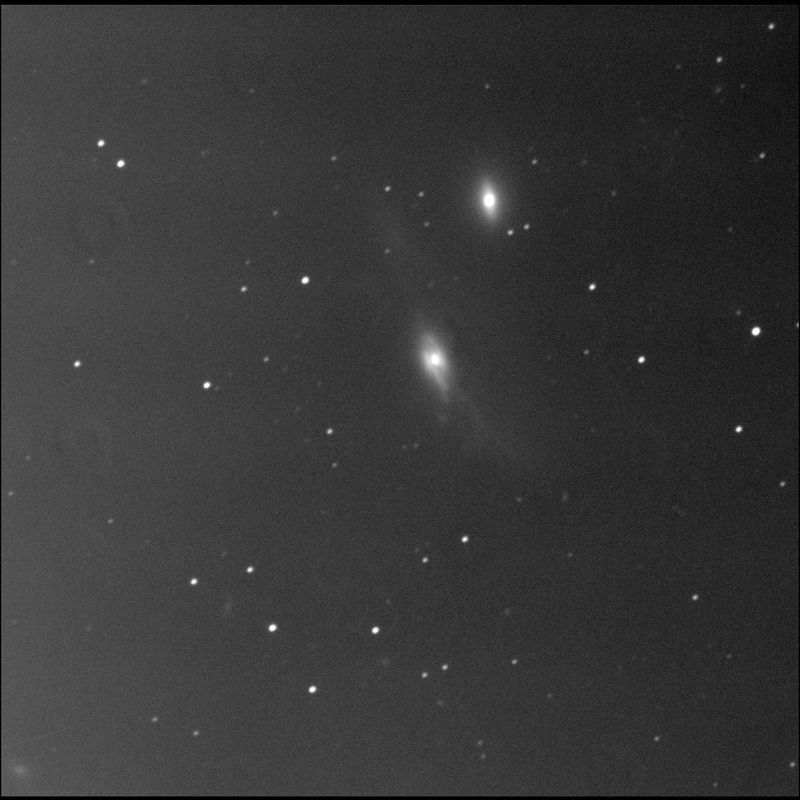 BGO imaged NGC 4438 (centre). 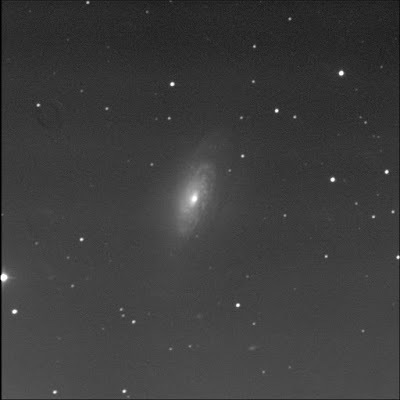 A fantastic galaxy in Virgo, it shows a huge halo greatly distorted by the nearby galaxy 4435. Not surprisingly, it is in the Arp catalogue, number 120. The cores of these galaxies are very bright. This target is another of the RASC Finest NGCs. Many call the two together "The Eyes." Ugh. A lot of gradient unfortunately. And the bright Moon was 63° away. The central region of NGC 4438 shows dust and mottling. Really interesting. To the north-west, I can see a small round fuzzy. 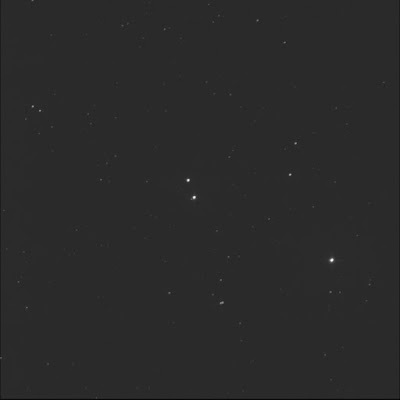 This is LEDA 169314, just below star J122716.5+130838. 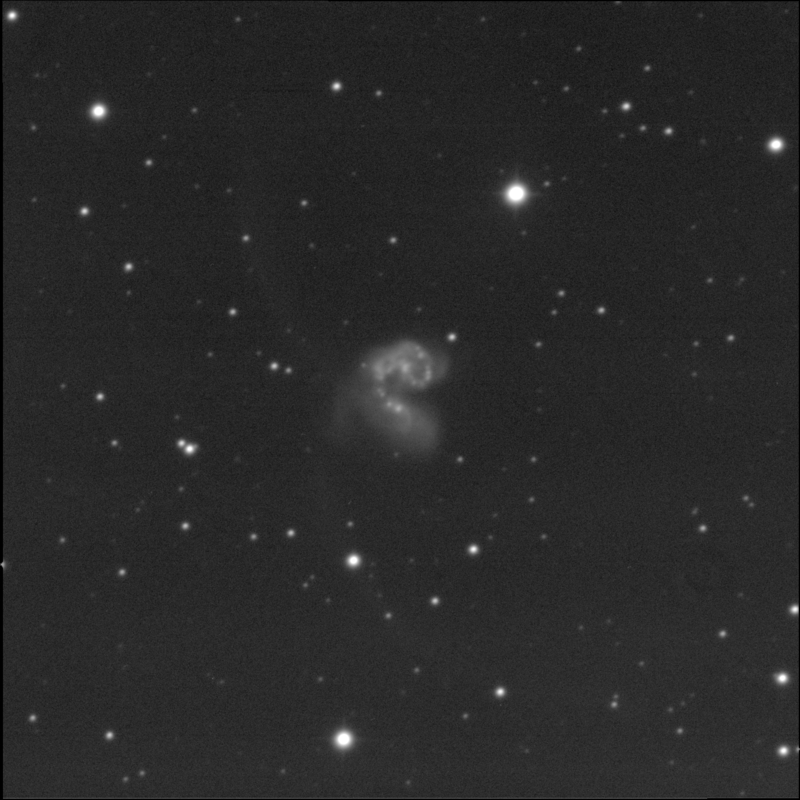 South-west of the big galaxy is a faint oval ball of lint: LEDA 169320. It is in the outskirts of the wisps of NGC 4438. 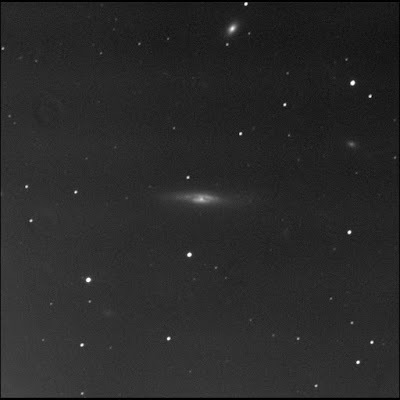 PGC 40890 is south-south-west of the warped spiral. It is faint and small and does not look completely round. PGC 40915 is a small almond shaped fuzzy south of a pair of stars with J122743.1+125233. 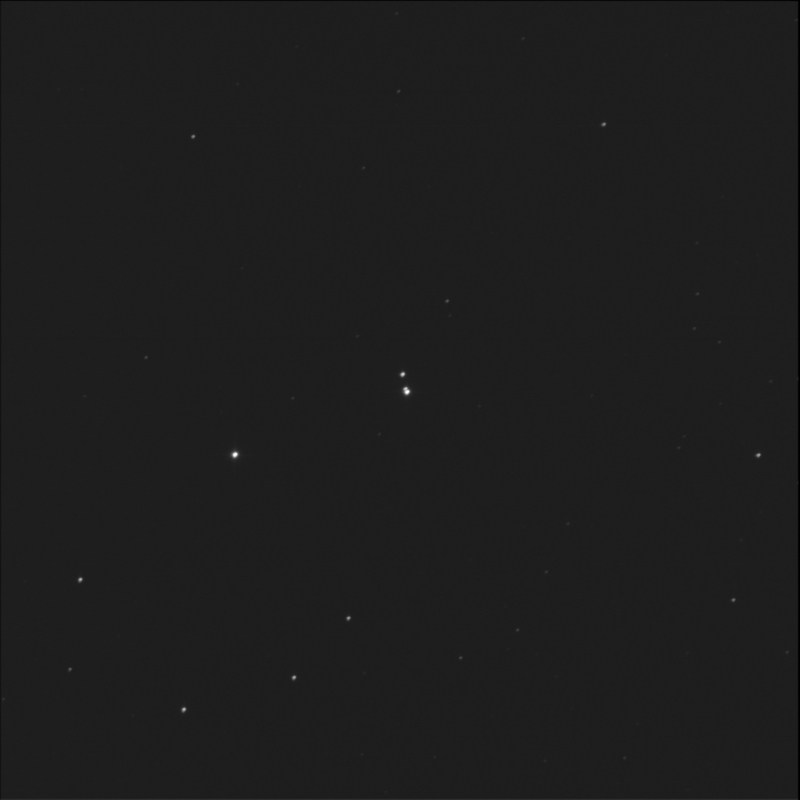 East of the pair is a round diffuse shape but it is not marked in SkyTools. 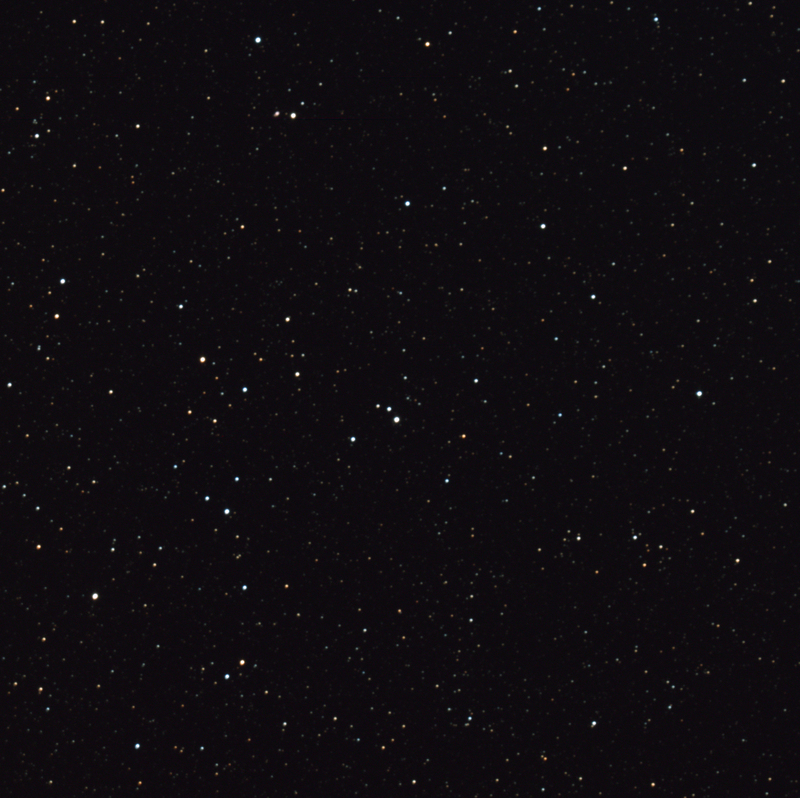 Nestled in the bright stars south-east of centre is the somewhat large elongated smudge of PGC 40958. Much further away, in the bottom-left corner of the image, is a large round fuzzy. This is IC 3388. And to the north-east, well away, there's a small oval lint thing: PGC 40981. I think there are many faint and small galaxies in the neighbourhood. Near the centre of NGC 4438, to the north-east, there's a faint streak. I don't know what this is. Asteroid? Cosmic ray? Background galaxy? Reshot on 13 May '18. 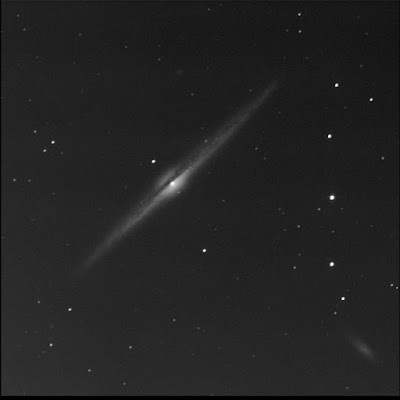 The Burke-Gaffney Observatory imaged edge-on galaxy NGC 4388. Located in Virgo, this spiral has some interesting structure near the core. Large diaphanous disk. One of the RASC Finest NGCs. 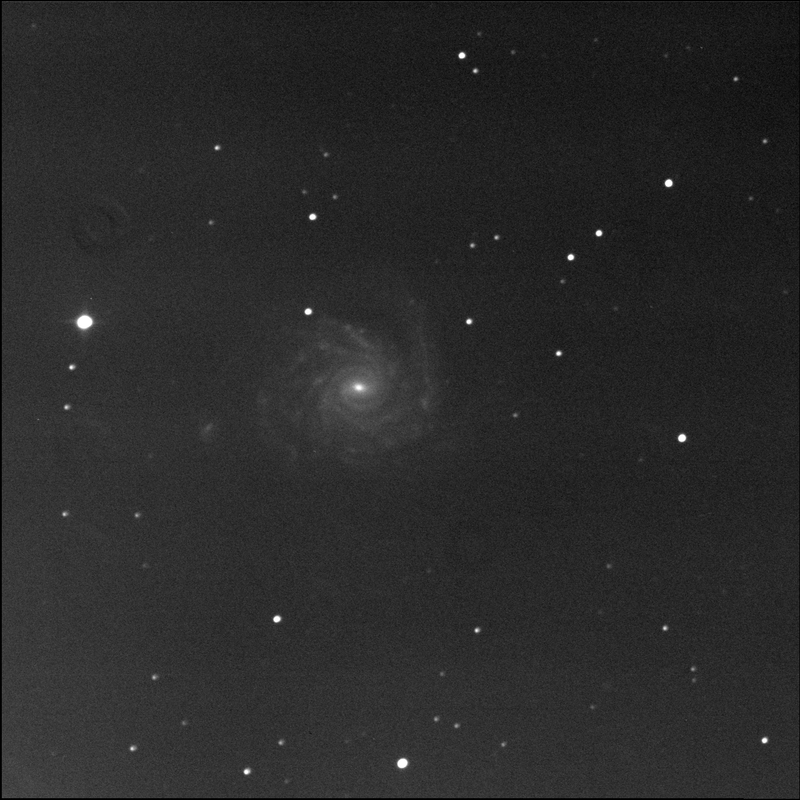 There is a triangle of small and very faint fuzzies north (above) the big spiral. SkyTools 3 Pro shows two of these, PGC 40611 to the east (left) and PGC 40577 to the west. The southern one is not IDed. 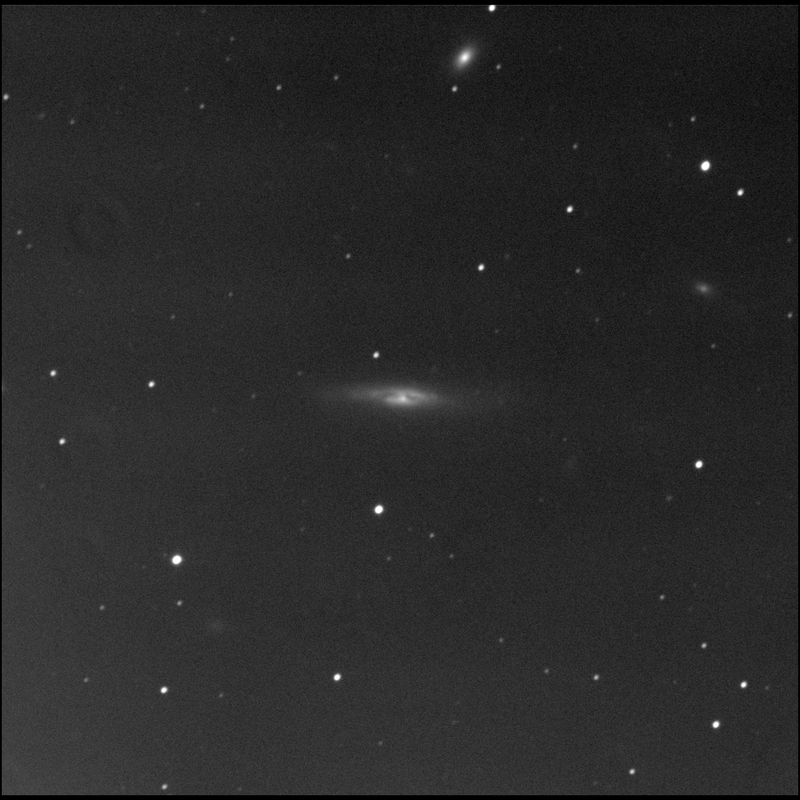 NGC 4387 is the bright but small oval elliptical to the extreme north (at the top edge of the frame). To the north-west, near star GSC 00880-0593, is a faint round smudge: LEDA 169262. 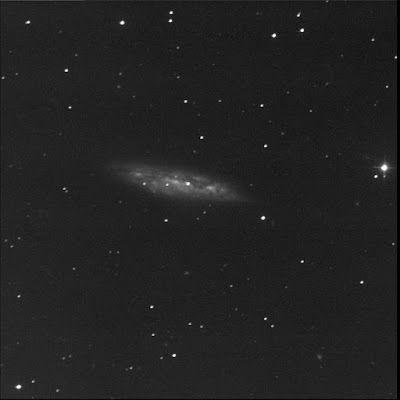 Diffuse IC 3303 is to the west-north-west of NGC 4388. It looks like a canted spiral to me; ST3P says it is a lenticular. 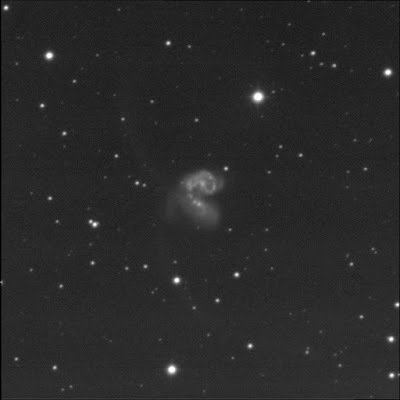 PGC 40519 is the somewhat large but very faint oval to the west-south-west. 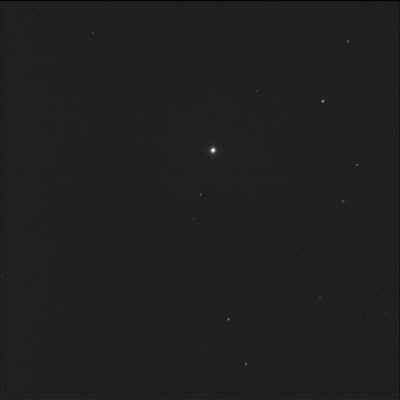 The brighter, smaller concentration further along is LEDA 169248. To the south-east there is a large, round, but very dim ball. This is MCG 2-32-45. And to the north-east, far away, is a small oval fuzzy: LEDA 169283. First viewed NGCs 4388 and 4387 back in May 2013. Sometimes Messier galaxies 84 and 86 with NGCs 4387 and 4388 are described as large face. NGC 4388 is the mouth and 4387 is the nose. 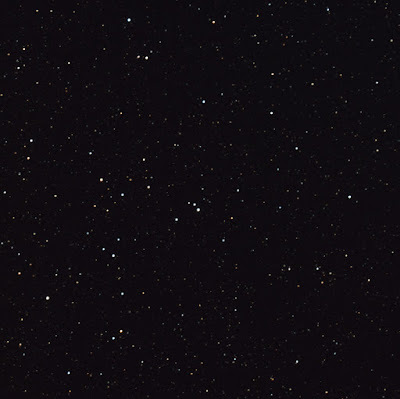 M84 and M86 are to the north, out of frame. 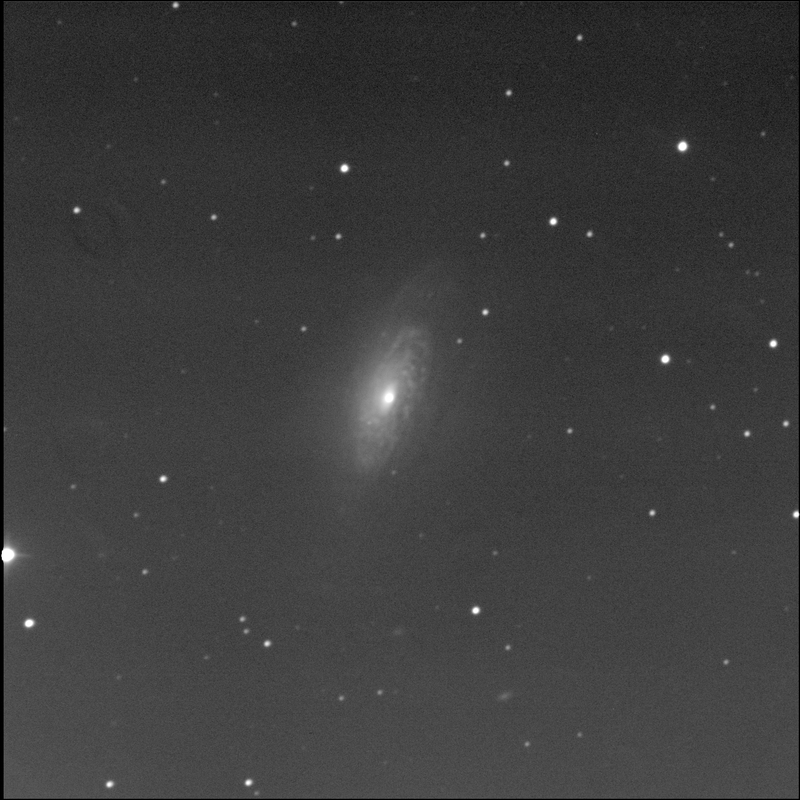 I wanted to improve on the data quality for NGC 1232, first captured on 21 Dec '17. This result is better, despite the bright Moon, as there is no satellite trail. Stretched it in a different way which increased the contrast. Proofed the Journal piece for the February issue. Something was wonky with one of the captions but otherwise OK. I still write choppy.